In the last posting I referred to a store in New Hampshire (now known to be 'The Antiquarian Bookstore') with a proprietor of a somewhat erratic disposition. I have since heard that the bloke is not a bad guy with a soft side to him when he is not belabouring your skull with an iron pipe. Moreover out of the goodness of his heart he takes the $5 browsing fee off your first purchase and that he actually has decent books. The motto of New Hampshire is 'Live Free or Die' and this man is simply following his bliss, dammit. Let him be. "As I recall there was also a virulent phone argument going on as I came in. Old San Jose book scouts tell many a tale about this place, possibly over a pint in the nearby Gordon Birsch brewpub. I have come across many unpleasant overpriced dull shops but this takes the biscuit... in the movie version of 'The Worst Bookshop in the Universe' the part might be played by Michael Keaton reprising his Beetlejuice persona." The shop went a few years back- probably mostly in dumpsters- but it has a half life on the net with the odd review still up as if it were still there. There is even a site where you can click on a phone and it rings the shop--I didn't try it and it would only get through if it was one of those new time machine phones. Was it not Eliot who said '...If all time is eternally present/All time is unredeemable.'? Haven't come across many lately- the great thng about the 'net is that you don't have to talk to bookshop proprietors- but there were quite a few candidates in the UK. The most annoying were the obnoxious sellers with good stocks- them you have to put up with. Hello I love your blog/webpage. absolutely full of information. Here is my pet bugbear.I go into a couple of used bookshops where i live somewhere in Arabia and I have found that the secondhand bookshops are the biggest vandalisers of books! they buy secondhand books at a pittance and sell them at almost the stated price on jacket, they are received in good condition (they will only purchase in good condition) and then they proceed to vandalise the book by writing in biro, in nice large letters the price and to finish the job put one or two, preferably two, bookshop stamps with their logo in any old place that comes to hand! This includes all nationalities. Now every young child in school is taught to respect books, do not write in them etc. Why do these grownups do this? Awesome post, as usual. Mr. Black was based on a collection of real characters. Jessica Salamanson (sp?) 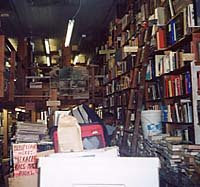 has some pretty funny stories of Seattle, WA bookstores, but I've lost her web addy. I made a mention of the "worst bookstore" article on my blog. wow...I used to drop in to this bookstore during lunch- a long time ago. I cannot recall the owner, but he had some great boxes of old magazines. I would spend lunch reading old popular mechanics and chopper mags. I was never charged to go and read even when I didnt buy.